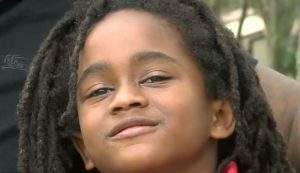 ABC News:- A 7-year-old Tampa boy is turning heads with his speed. Rudolph “Blaze the Great” Ingram Jr.
“How old were you when we started training? Like four? We started training around four,” said Rudolph Ingram Sr.
“I can give him all the tools to be great, but his drive and work ethic and competitive mentality, it sets the bar so much higher,” he said. “It feel great, anyways I trained for it,” Blaze said. “I have seen him lose mid race and just take off and get faster. He does not like to feel like a loser. He wants to win,” said Rudolph Sr.
His dream? “To get into the NFL,” Blaze said. But he hasn’t picked a team he wants to play for yet. He watched the Usain Bolt documentary, he has seen a lot of those people’s documentaries and he realizes that they were doing the same thing that [he] was doing at that age. So [he] could see where this would lead to,” said Rudolph Sr.